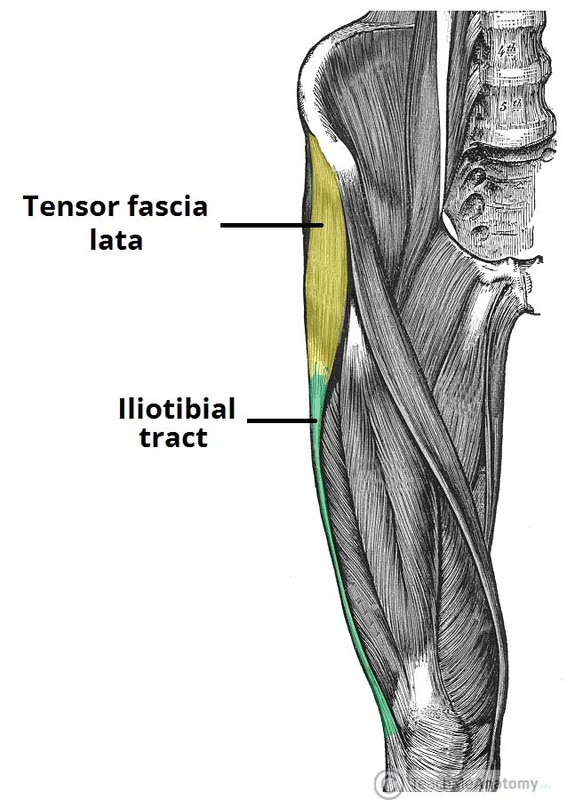 The iliotibial band (also termed the iliotibial tract) is a branch of longitudinal fibres that form the shared aponeurosis of tensor fasciae latae and the gluteus maximus. It extends from the iliac tubercle to the anterolateral tubercle of the tibia (Fig. 1). Inflammation of this band results in the condition termed iliotibial band syndrome (ITBS). Iliotibial band syndrome is the most common cause of lateral knee pain in athletes, with a reported incidence of 1.6-12%. The exact pathology of ITBS is unknown*, however is thought to be linked to repetitive flexion and extension of the knee, causing impingement of the band against the lateral femoral condyle. In this article, we shall look the risk factors, clinical features and management of iliotibial band syndrome. Anatomical risk factors include genu varum, excessive internal tibial torsion, foot pronation, and hip abductor weakness. Lateral knee pain is the classical clinical feature in iliotibial band syndrome, exacerbated by exercise, often found in patients who take part in frequent exercise or with a sudden increase in intensity (such as training for a marathon). Pain may also be worsened running downhill or on an excessive camber. In the history, ensure to assess for any previous trauma (more suggestive of ligamentous knee injury) or features of osteoarthritis. Examination may often be unremarkable, only with pain localising to lateral aspect of the knee. Certain special tests can aid in making the diagnosis. Nobles test – the patient lies in a supine position and the examiner places a finger on the lateral femoral condyle, with the knee slowly extends. A positive test is indicated when pain is felt at 30 degrees, when the ITB passes over the lateral femoral condyle. Renne test – the examiner stands in front of the affected knee and puts pressure on the lateral epicondyle, with the patient then asked to squat. A positive test is indicated by the presence of pain at 30 degrees of flexion. The diagnosis of iliotibial band syndrome can be made clinically. Imaging, such as plain radiograph or MRI imaging, can be used to exclude other pathology, if the history and examination are not conclusive. There is little evidence for the management of ITBS. Most patients can be advised to modify their activity accordingly and use of regular simple analgesics during periods of acute pain. Longer-term management can often include local steroid injections, in aid to reduce localised inflammation, and physiotherapy, including a period of stretching followed by strengthening of the muscles around the knee joint. Surgery is only indication if patients remain symptomatic or functionally limited after 6 months, despite all other non-medical treatment. Surgical management involves release of the iliotibial band from its attachments from the patella, allowing for a greater range of movement. This can be done either percutaneously or via an open approach.